A white development proposal sign has been stuck to the outside of the former Canada Post facility at 1029 Queen Street East for close to nine months now, with no sign of construction activity. But that could be about to change now that city council is poised to clear one of the remaining hurdles for a six-storey rental complex at the corner of Winnifred Ave. 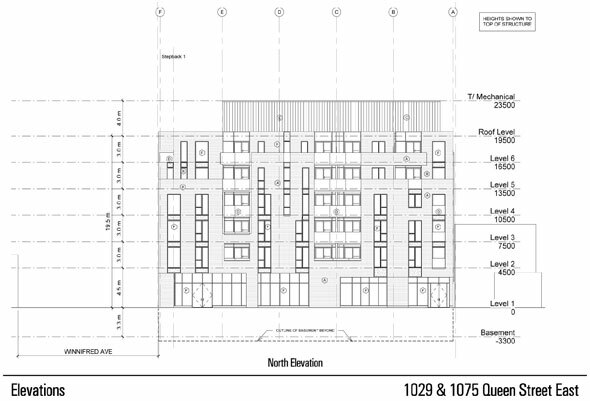 The proposed building is due to contain 48 units, a mix of one-, two-, and three-bedrooms, with retail space on Queen. The footprint will require the demolition of a single rowhouse with an unusually long backyard on the east end of the property. That space, which gives the property a strange panhandle shape, will become a private outdoor green area. All but three of the building's parking spaces will be managed by a mechanical stacker system off the laneway at the rear. The building has been scaled back from the original proposal, which called for eight storeys and a couple more residential units. The frontage of that design included several balconies and slightly more retail space. Looking at historical maps of the area, it appears the brick Canada Post office was one of the first buildings on the site. From between 1899 and 1924, the lot was subdivided with the stores on the other side of Winnifred but remained undeveloped. An industrial building is visible on aerial photographs from 1947 onward. The development joins a series of other residential buildings currently in the planning or construction phase on Queen. At the corner of Pape, the troubled Film Studio Lofts has finally returned to life as Lofts on Queen. Further west, there are plans for a six-storey building just west of Leslie and another eight-storey block closer to Greenwood. The vacant lot next to Stratengers is also a target for development. The city still needs to grant site plan approval before work can begin. TOTAL RETAIL SPACE: 292 sq. m.